When Linus Omark was cut by the Edmonton Oilers, just days before the start of the regular season, he wasn’t happy. The 23-year-old Swede blamed politics and gave a “no comment” when asked about his potential future with the Oilers organization. As he said those things, it was obvious by his demeanor that he was biting his tongue and maybe would have liked to say a lot more, but he didn’t and he reported to Edmonton’s American Hockey League affiliate in Oklahoma City with no problems. Oilers coach Tom Renney had no problem with Omark’s comments and almost encouraged them, saying he was glad to see that he wasn’t happy with being sent down. “He will play in the NHL,” said Renney. Well, with the way things are going down on the farm, that might happen sooner rather than later! 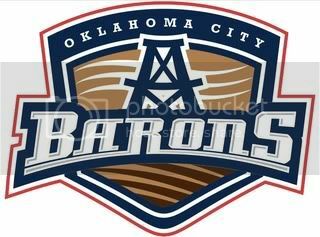 With his Oklahoma City Barons trailing 4-1 to the Toronto Marlies on Sunday, Linus Omark scored five times and again in the shootout to help lift OKC to a 7-6 win and first place in the AHL’s West Division. Yes, you read that correctly: Omark scored three goals in the second period, two more in the third and again in the shootout (Milan Kytnar had the shootout winner). Omark and his linemates, Liam Reddox and Ryan O’Marra, combined for 11 points on the night as the Barons improved to 6-1-0-0 in their last seven games. That gives Omark 10 goals on the season, tying him for tops in the league in that category, and a Barons best 17 points in 15 games. If he keeps scoring like that and showing that he is adapting better to the North American style of hockey, I would imagine that he’ll get his shot with the big club eventually. That “eventually” could turn in to a “right away” if the leg injury to Oilers captain Shawn Horcoff keeps him out of action.